Teachers know how important feedback is for the learning process. Students need more than a simple test score if they are going to make progress; they need actionable information that guides them in the right direction. 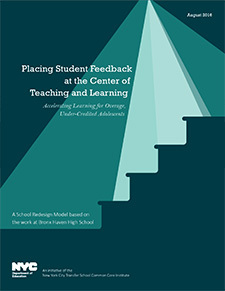 In our recently published monograph entitled Placing Student Feedback at the Center of Teaching—part of a series that captures practices and tools that support deeper learning for overage and under-credited adolescents at transfer schools across New York City—we share how Bronx Haven High School teachers developed their feedback practices. From 2012 to 2015, Bronx Haven was a member of the Transfer School Common Core Institute (TSCCI), an innovative professional development institute led by the NYCDOE’s Office of Postsecondary Readiness. Through coaching provided by TSCCI partners Eskolta and reDesign, Bronx Haven’s principal at the time, Lucinda Mendez, and a team of teachers launched a multiyear effort to shift the school’s focus from traditional outcome measures—like standardized test scores—toward the learning process itself. Teachers began integrating more time for feedback and revisions into their classes. Initially, there was concern that the time taken away from covering content could lead scores on the statewide Regents exams to drop. Instead, Regents scores improved in every content area for three years in a row. This report shares the strategies and tools that Bronx Haven teachers designed and tested to support student learning.